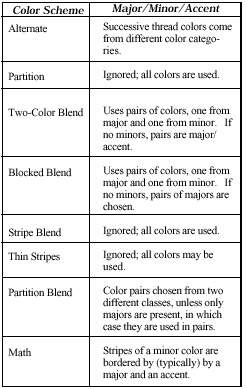 The table of color schemes (right) summarizes how the various schemes interpret the position of chips in the colorway window. This scheme is a generalization of traditional “end-on-end” coloring (e. g., Chambray). If there is exactly one color chip in the Major, one in the Minor, and none in the Accent, Alternate assigns every other thread every other color (or, equivalently, all the odd numbered threads are given one of the colors and the even numbered threads the other color). If there are more than two colors, but all colors are in either the Major or Minor (no Accent), then Alternate assigns all the odd numbered threads from colors in one category and the even numbered threads from the other category. Since this rule leaves considerable leeway, especially if there are many color chips present, each time you use this scheme you will get a different color arrangement. But they will all have a fine-grained look which is characteristic of Alternate. If colors are present in all categories, Alternate becomes quite complicated. It follows two rules: (a) No two consecutive threads receive colors from within the same Major/Minor/Accent group. So, if a thread is col-ored using a Major color, the next thread will be colored from either the Minor or the Accent colors. Create a series of stripes of widely varying widths, using all colors regardless of their classifi-cation. The order in which the colors appear is different each time you use this scheme, but the order is fixed within each specific color arrangement. For example, suppose you have four colors called A, B, C, and D. The first time you use this scheme it might choose to use the colors in the order CABD. It will use that order across the entire width, so color C would not appear next to color B anywhere. But the sec-ond time you use the scheme, it might decide to use the order DABC. In this case, every time you saw a stripe of color B it would be immediately followed by a stripe of color C.
Note: because of the mathematical constraints on this scheme, it only works on certain counts of threads. If you give it a number of threads which it cannot handle, it acts like the Partition Blend scheme instead (see facing page). A two-color blend (see “Blends” in the Index for a definition of blends). The two colors are taken from the majors if there are neither minor nor accent colors present. If there is at least one minor color, then the two colors are selected by taking one major and one minor color. If there are no minor colors but there is at least one accent color, then the two colors are selected by taking one major and one accent color. The area to be colored is broken up into a series of stripes, of widely varying widths. Within each stripe the two colors are blended (see “Blends” in the Index for a definition of blends). Creates a series of wide stripes of roughly equal width and does a two-color blend within each stripe. Creates relatively thin stripes of colors taken from all color categories. Creates a smooth mathematical function and uses the value of the function at each thread to determine which color class to use and which color from the class. This produces stripes of widely varying widths. Some-times the stripes are arrange-ment symmetrically about the center of the area being colored, and sometimes not. Faithfulness to given color class proportions varies with shape of the function. Creates surprisingly conservative stripes when used with a small number of major and minor colors, but can also generate wildly asymmetric patterns.